So as I talked about in my last blog post we had a great GStreamer hackfest. A lot of things got done and quite a few applications got an initial port over to 0.11. For instance Edward Hervey ended up working on porting the Totem video player, or rather trying to come up with a more optimized design for the Clutter-gst as the basis port was already done. Another cool effort was by Philippe Normand from Igalia who put a lot of effort into porting WebKit to use 0.11. His efforts where rewarded with success as you can see in this screenshot. Jonathan Matthew had flown up all the way from Australia and made great progress in porting Rhythmbox over to the 0.11 API, a port which became hugely more useful after Wim Taymans and Tim-Phillip Muller fixed a bug that caused mp3 playback not to work :). Peteris Krisjanis made huge strides in porting Jokosher to 0.11. Although like Jason DeRose from Novacut and myself on Transmageddon he did end up spending a lot of time on debugging issues related to gobject-introspection. The challenge for non-C applications like Jokosher, Novacut, Transmageddon and PiTiVi is a combination of the API having changed quite significantly due to the switch to gobject-introspection generated bindings, some general immaturity challenges with the gobject-introspection library and finally missing or wrong annotations in the GStreamer codebase. So once all these issues are sorted things should look a lot brighter for language bindings, but as we discovered there is a lot of heavy lifting to get there. For instance I thought I had Transmageddon running quite smoothly before I suddenly triggered this gobject-introspection bug. There was a lot of activity around PiTiVi too, with Jean-François Fortin Tam, Thibault Saunier and Antigoni Papantoni working hard on porting PiTiVi to 0.11 and the GStreamer Editing Services library. And knowing Jean-François Fortin I am sure there will soon be a blog with a lot more details about that :). Thomas Vander Stichele, who also wrote a nice blog entry about the event, was working with Andoni Morales Alastruey, both from Flumotion, on porting Flumotion to 0.11, but due to some of the plugins needed not having been ported yet most of their effort ended up being on porting the needed plugins in GStreamer and not so much application porting, but for those of you using plugins such as multifdsink, this effort will be of great value and Andoni also got started on porting some of the non-linux plugins, like the directsoundsink for Windows. Josep Torra from Fluendo ended up working with Edward Hervey on hammering out the design for the clutter-gst sink at the conference, but he also found some time to do a port of his nice little tuner tool as you can see from the screenshot below. George Kiagiadakis kept hammering away at the qtGStreamer bindings, working both on a new release of the bindings for the GStreamer 0.10 series, but also some preparatory work for 0.11. In addition to the application work, Wim Taymans, Tim-Phillip Müller and Sebastian Dröge from Collabora did a lot of core GStreamer clean ups and improvements in addition to providing a lot of assistance, bugfixing and advice for the people doing application porting. All critical items are now sorted in 0.11 although there are some nice to have’s still on the radar, and Wim plans on putting out some new releases next week, to kickstart the countdown to the first 1.0 release. As for my own little pet project Transmageddon, it is quite far along now, with both manually configured re-encodes and profile re-encodes working. Still debugging remuxing though and I am also waiting for the deinterlacer to get ported to re-enable deinterlacing in the new version. 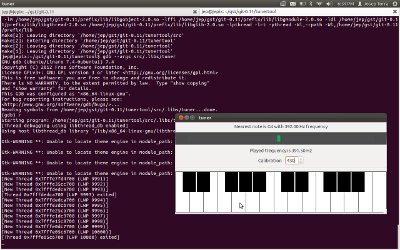 For a screenshot take a look at the one I posted in my previous blogpost. 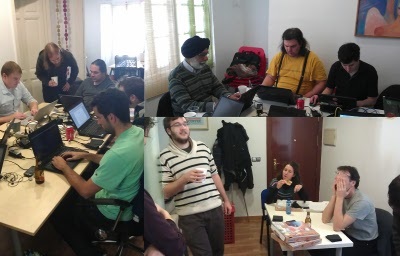 Things have been going really well here at the GStreamer Hackfest in Malaga. Thanks to the help of Ara and Yaiza from Nido Malaga, we have a great venue in downtown Malaga and they have also helped us greatly with sorting out food. Also making good progress on Transmageddon, even if the move to GObject Introspection bindings are making things a bit more complicated. Screenshot below of the progress so far. Also a big thanks to Fluendo who is sponsoring the lunches at the hackfest and Collabora who is sponsoring tonight’s dinner. Ensuring that no hacker is left hungry during this hackfest. Tomorrow I will be heading off to attend the GStreamer Application Porting Hackfest in Malaga, Spain. I think we have managed to pull together an absolutely incredible group of people for this event and I have great hopes that by next weekend we will have squashed a ton of bugs in GStreamer 0.11/1.0 and also have initial ports of a long range of important applications and bindings. This is the first time in GStreamer history that we are trying to hold a hackfest focused on application developers, but hopefully it will be the first of many and that they can become a good way for the core GStreamer community and the application development community to interact and collaborate more closely. Also want to say a special thanks to the community members attending the event on their own and also to the companies sending their employees to the hackfest; Collabora, Fluendo, Flumotion and Igalia and finally a special thanks to the GNOME Foundation for sponsoring some of the attendees. I am happy that I managed to get this far. Hopefully it is a sign that the upcoming GStreamer hackfest in Malaga will be a great successful everyone who is participating. I hope the remainder of the porting effort will be relatively simple as I would love to get back to working on real features instead of just updating old functionality to use a new backend to do the same. Having had a need for Transmageddon for a couple of work related tasks recently a couple of items, like batch job programming has moved up my priorities list. Just posted another interview on the Collabora website, this time with Gustavo Noronha Silva talking about WebKit and some of the work he and Collabora are doing around that project. So be sure to check it out if you want to learn more about things like WebKit and Clutter integration and how WebKit impacts the GNOME platform.